If you’re moving to London as an accompanying spouse or partner (also referred to as “trailing,” a description I personally dislike), I’m following up on yesterday’s post concerning the disruption to life an international relocation can be when it’s not your own job taking you there. Now, for as much as I allowed myself to vent in Part 1 about what makes the move difficult as an accompanying/trailing spouse, it took me a while to realize that sitting around complaining wasn’t going to help anything. The natural scapegoat in this scenario is going to be your spouse/partner, but that’s not the productive way to proceed. Relocating for their job is already a sign of your love and support for them, right? So you will be feeling entitled to the same from them, and the key to gaining that mutual support will be communicating clearly and rationally why the adjustment is going to be or already is so hard for you. Try your best not to turn it into a blame-game; take ownership of your own happiness. That isn’t to say, though, that you can’t assign some accountability to your partner, too, so they know how their decisions impact yours in turn. An article I recently read by Ellen Scholten on ExpatCareers.com spells it out: it refers to the concept of Maslow’s Hierarchy of Need in relation to relocation. This is something you’ve probably learned in school but haven’t related to your own life lately. And it comes with a visual aid, even better for putting it in terms a spouse/partner can understand! So, picture a pyramid (or just look at the image above ;)). At its wide base are our fundamental human needs to stay alive. At the very least, we need food, water, air, etc. to meet our physiological requirements. Once those needs are met, we can prioritize our safety—having shelter, job security, and health, for example. When we don’t have to worry about those things, we can then progress up the pyramid to meet our emotional needs—to love and be loved and feel confident in and respectful of ourselves while also respecting others. At the very pinnacle of this pyramid, then, is the abstract touch-feely stuff of life fulfillment we can then strive to achieve now that our more basic needs have been met; this can relate to our intellectual and creative pursuits, shaping our morality, and all-around self-discovery of our inner landscape. 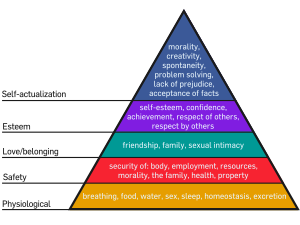 So, as Scholten states, an international relocation can turn our Maslow pyramid on its head. Not that moving abroad doesn’t also entail a lot of change and stress for the spouse/partner who is initiating the relocation, but the job or study program they’re moving for is at least a known quantity, and it’s something that furthers their aspirations, thus satisfying their needs on both the security and self-actualization levels—and those in between if that sense of responsibility and achievement boosts their confidence and gives them a work community of peers to belong to. The accompanying spouse, though—the one who leaves behind an existing professional and social network, not to mention an established home—gets knocked down a few pegs. Stick with me next week as I conclude this topic with Parts 3 and 4, elaborating more specifically on how one’s pyramid of needs gets toppled by an international relocation and how to work together with one’s spouse/partner to rebuild it.